by The Builders Association and "dbox"
I'd like to stand up for Super Vision, the new mixed media piece by the digital-friendly collective, the Builders Association at BAM. (It is also a collaboration with the group "dbox.") If the Times (and my company last night) are any indication, it will be dismissed as mere gadgetry. And I certainly thought that was true of their last effort the glib telemarketing- fantasy Alladeen. Which is why, perhaps, I was so taken with Super Vision--which presents a quite cogent series of what they might like to call "scenes of identity theft." With an improved sense of focus since Alladeen, three storylines show us familiar, yet effective, ways in which the mass collection and dissemination of personal data via fiber optics can impact our lives: a Ugandan born Indian businessman tries to hold up under the inspection of a series of INS officers, at different US airports, who all reveal a surprisingly exhaustive amount of personal information about him; a boho white suburban couple's dream house and upscale lifestyle is exposed as funded by the husband's exploitation of his young sun's identity to run up half a million dollars of virtual debt in unpaid credit cards; and a Sri Lankan young woman in New York explores a memory bank of her family's past (photos, documents, etc) via internet "cam" with her aging grandma back in the old country. Nothing new may be said here about virtual identity and internet privacy, sure. 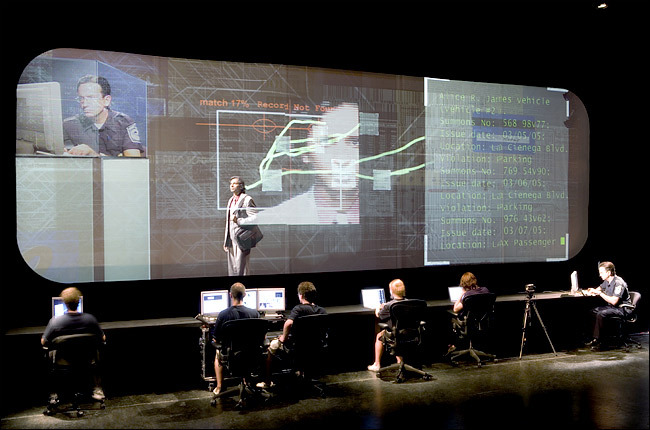 But I did feel a powerful effect in watching the beleaguered traveler-character go through thumbprint, facial recognition, and retinal scans, with the full details of the digital imaging on display--as if we were witnessing a live dissection. (Or, is it "live" or is it theatre?) The little boy being cyber-abused by his own father is appropriately represented to us only digitally "on screen"--the interaction between the actors and this virtual child are sometimes chilling. For all the (by now) familiar nightmare scenarios, Super Vision finds some uniquely compelling--and appropriately technological--ways of visually representing/illustrating them. And then there's the sheer technology itself. Again, if you're at all curious about the level of digital imaging possible in live theatre, it behooves you to go check this out. (And to really mix it up, you can catch William Dudley's cyclo-projections over at the other end of the artistic spectrum in the latest Andrew Lloyd Webber show.) Some say the huge screens and flashing lights overwhelm the mediocre, almost novice, acting. True, human emotions are not at the core here. But, still, I found Super Vision a memorable--and, yes, stageworthy--vision of the "artificial intelligence" of our age. And at a time when so little theatre turns a mirror on current society directly, I was glad to contemplate its breezy 70 minutes, even occasionally shuddering at the world being reflected back to me.